A delightful reminder of the holiday season. 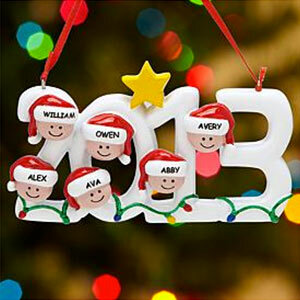 This bestselling 2013 Head Ornament lets you celebrate the year in a unique way. The perfect keepsake decoration, this ornament can be custom designed to match the number of members in your family (up to six)! Personalize this unique head ornament with the names or nicknames of up to six family members. Each name is printed on the white area of the Christmas hat representing each family member. Order this adorable head ornament today and begin a yearly tradition as you add a new one to your Christmas tree each year! This ornament also makes an excellent Christmas keepsake gift for that special couple or family on your list this season! Order your custom 2013 Head ornament today!